The Cape Griffon Vulture (more commonly known as the Cape vulture) is a large bird; the largest of its kind in Africa. Its size is clearly no measure of its ability to survive for the IUCN Red List lists it as Vulnerable and it is also the most endangered of the vultures; its already small population, distributed over various colonies, likely to continue declining unless conservation increases its efforts. Called ‘Cape’ vulture because of the bird’s original commonplace sighting throughout the former Cape province of South Africa, it is today confined to a small part of south and southwest Africa. Its population has significantly declined over the last few decades. Today there are colonies in Botswana, Lesotho, Mozambique and South Africa. In Swaziland they are extinct, and only non-breeding populations survive in Zimbabwe and Namibia. In South Africa 39% of the colonies recorded between 1987 and 1992 are now inactive. 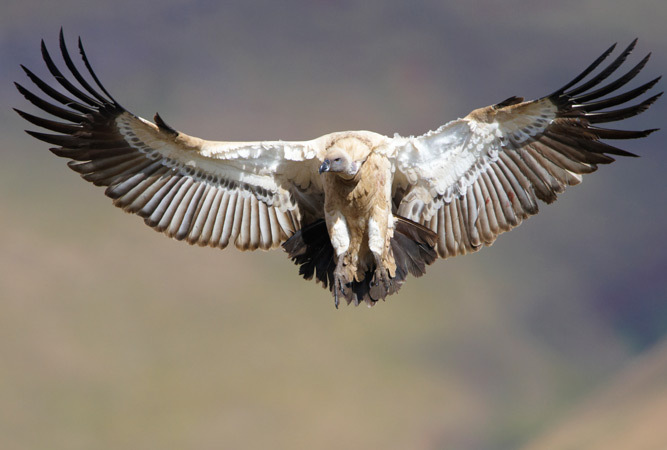 In 2006 an estimation of the total population of Cape vultures brought the overall figures to between 8 000 and 10 000 individuals. The species is thought to have declined by as much as 70% between 1992 and 2007 in eastern South Africa. The griffon’s plumage is a beautiful creamy-buff contrasting sharply with its black bill and dark flight and tail feathers. The adults distinctive eyes are honey-coloured, their throats tinged with blue. In flight the underside of their wing feathers shine silver against the sky. They’re highly sociable birds, nesting and roosting in cliffside colonies and scavenging for food in large groups that range in net formation across the sky – they can fly as high as 8 000 metres and across great distances. Their eyesight, scientists have suggested, is eight times better than humans. The sociable behaviour extends to a great deal of bickering when too many of them gather at a carcass, which often happens. Their colonies extend to up to 1 000 breeding pairs on stick platforms, which they edge with grass, set precariously on cliff edges. Each breeding pair lays but one egg for which they are both responsible. As many as sixteen different factors are thought to contribute to the Cape griffon vulture’s decline. Electrocution by power lines, drowning in water tanks, disturbance at colonies, bush encroachment and collisions with cars are more recent problems. A shift in migratory patterns of game, and an increase in domesticated game (farmers tend to bury their livestock when they die) has meant that there is less food available. 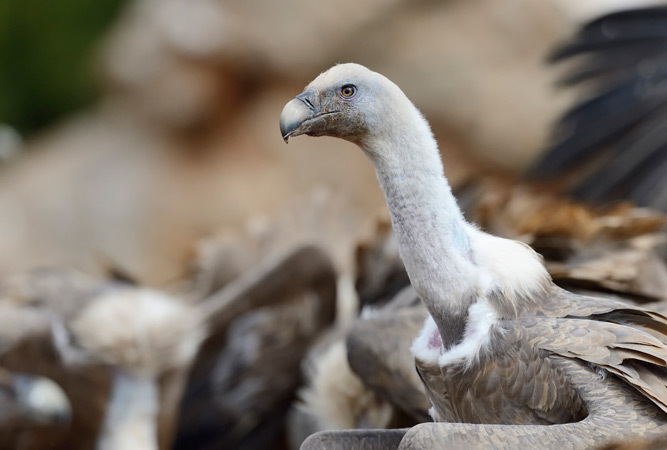 Vultures are caught and used for apparent medicinal and psychological benefits – every year as many as 160 vultures are thought to be sold and used for consumption in eastern South Africa. If this level of consumption continues the vulture will become locally extinct within 45 to 53 years. Many Cape vultures die from poisoning. Farmers who poison carcasses in a bid to kill predators, like jackals and leopards, end up killing large groups (as many as 50 to 500) of Cape vultures as a result. 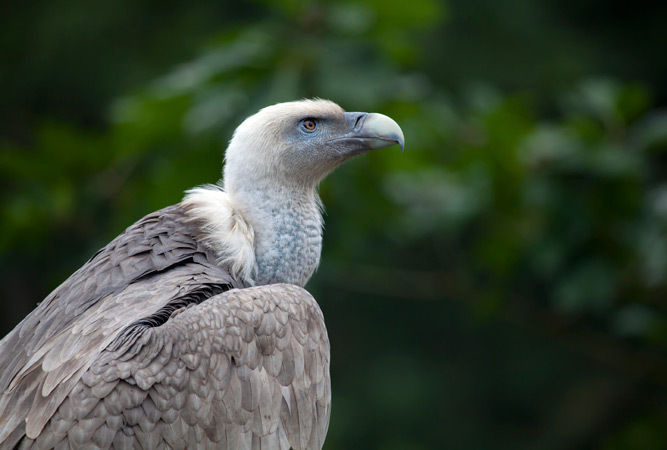 An additional issue is the skeletal abnormalities evidenced in chicks as the number of carnivores living within a vulture’s range have decreased. Where carnivores would formerly have broken up carcass bones into smaller fragments, perfect to feed to chicks, this is no longer happening. Human intervention in the form of insensitive tourism led directly to a key colony collapse in Botswana. The Cape vulture is a high priority. 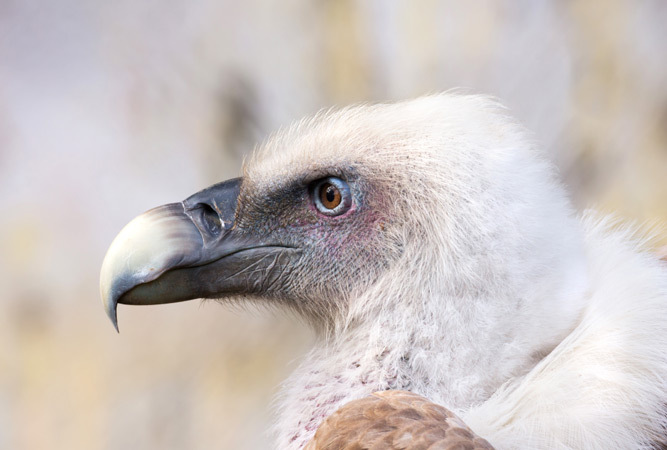 The Vulture Study Group, one of the founding components of the EWT (Endangered Wildlife Trust), is held within the EWT’s Birds of Prey Working Group. They supervise the work of the Cape Griffon Task Force, which monitors each of the main breeding colonies of Cape vultures across South Africa. One of the ways in which farm owners help is with vulture feeding sites, or vulture restaurant – providing an undisturbed area with safe meat and offal, including chipped bones so that the chicks have access to calcium. But this method is not without its critics – birds become lazy and forage only at restaurants, creating an artificial colony. Marakele National Park is home to the largest colony in South Africa. Over 800 breeding pairs make their precarious nests on Kransberg’s cliffs. The views from up atop the mountain, and the close proximity to the vultures, are the reason many visit this reserve. The second largest colony in the country breeds on the Blouberg in the Soutpansberg in northern Limpopo, whilst another 50 to 100 pairs breed on Buffelspoort and Uniondale, west of the Sand River. The Blouberg Mountain’s colony has 700 pairs. The third largest Cape vulture colony in the country, Manoutsa Vulture Colony is considered the nesting site of the Kruger National Park’s Cape vultures. The colony roost on the private farm, Manoutsa. To spot them with the naked eye is as simple as driving through the JG Strijdom tunnel towards the lowveld, as the birds fly on the mountain pass. All you need is a good pair of binoculars and the time to focus on the cliffs a few kilometres down the road. The Collywobbles vulture colony of roughly 300 breeding pairs occurs along a series of convoluted cliffs 5 km up the road from the Collywobbles store in the former Transkei, south of Elliotdale. The scenery is spectacular and the site remote. There are colonies at Skeerpoort (Leopard Lodge), Nooitgedacht (the highest point of the Magaliesberg Mountain) and Robert’s Farm (closer to Rustenburg) with Skeerpoort having the largest collection of 219 breeding pairs. Magaliesberg vultures are dependent on vulture restaurants for their survival. 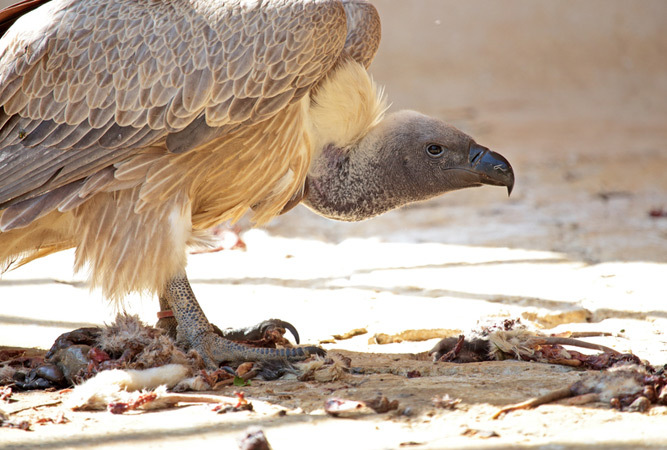 Visit VulPro, a vulture rehabilitation centre close to Hartbeespoort. De Hoop Nature Reserve in the Cape Overberg is home to the only remaining Cape vulture colony in the Western Cape. The colony roosts in a rough-hewn gorge on Potberg Mountain, sharing the cliffs with other birds of prey, like Verreaux’s eagle, the jackal buzzard and rock kestrel. From a mere 30 birds during the 1970s, the colony is now relatively stable, at between 150 and 175 birds. The farmers in the area help keep them alive with carcasses of livestock.